The perfect accompaniment to your diamond solitaire ring, this tiara shaped ring enhancer is fashioned with rows of 18 certified round brilliant cut diamonds, set in 18 karat white gold. The sparkling design is also available in rose gold. The gap between the shank guards is 2.94 mm. 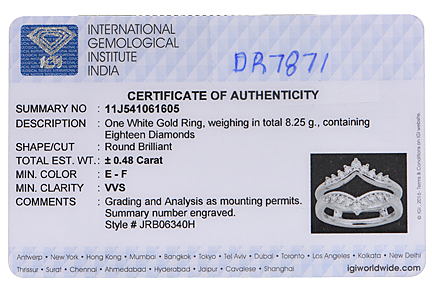 The top head of the ring accommodates a solitaire stone that has a maximum width of 7.08 mm. Need assistance on sizing? Check out our ring size guide. The solitaire is sold separately; check out our engagement rings section or speak to a sales agent for customized options.